Hi there! Thanks for popping over for my friend Jamie's Blogiversary!!!! Its so exciting to celebrate Blog anniversaries!! If you just happened to hop here and want to start at the beginning click here. If you came here from Candace's blog you are in the right spot! Jamie loves purple and wanted us to use it in our projects! Here is my Purple Project! I wrapped white yarn around a straw wreath. I cut some purple roses from my Close To My Heart- Art Philosophy Cartridge and added a purple and white checkered ribbon! Comment on all blogs and Follow Jamies blog for your chance to win the Jaded Blossom Make a Wish Stamp set or Trendy Twine Grape Fizz Twine! Oh my goodness, this is beautiful. The colors are my favorite. Love the wreath. The flowers came out great. I love your wreath! I love the color of the paper you used for the roses. Kim, such a pretty wreath. Those flowers are beautiful! That is one awesome wreath! Love the flowers they really set it off1 TFS! Your wreaths are just fabulous :) I just love the flowers, very elegant. Thinking I made need to try something like this. Very pretty!! i love the rolled flowers! Very pretty. Love the flowers. Def need to get that cart. Nice being in the hop with you. Beautiful!!! I love love love this! Beautiful wreath, love the flowers, thank you so much for sharing it. What a pretty wreath. I love the purple flowers they are the perfect finish for it. Thanks so much for sharing. 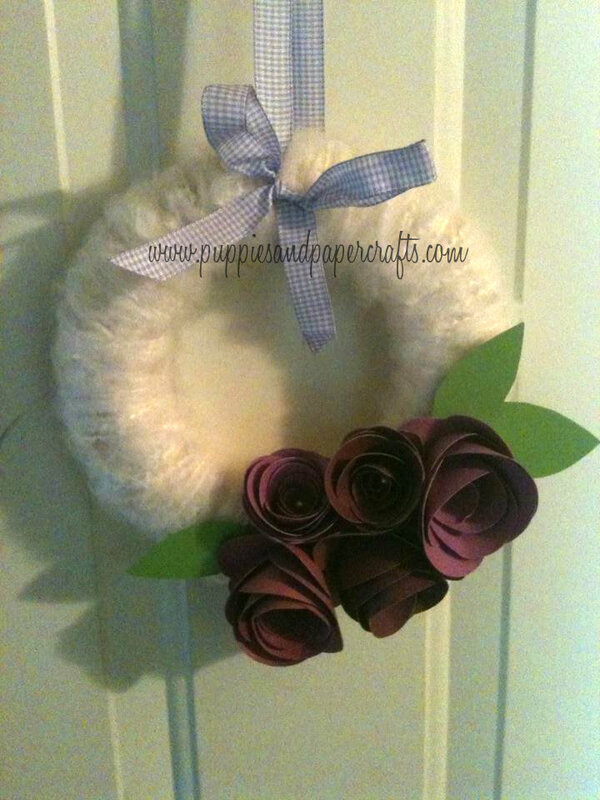 Very pretty wreath... what a great idea!! Your wreath is so pretty!! Aww Kim this wreath is darling!! Im working on getting that Art Philosophy cart..:) Those roses are beautiful! Tfs! Cute project! Thanks for sharing! super cute love the twine! thanks for sharing. Its a Wrap Blog Hop! !